Not everyday truck drivers who traverse thousands of kilometers in his lifetime can find a mobile medical unit at his disposal. This breed of professionals, who drive, day in and day out are vulnerable to the most possible health hazards. As part of its Corporate Social Responsibility (CSR) Piramal Swasthya Management and Research Institute (PSMRI) based in Hyderabad and ably supported by Piramal Foundation, in collaboration with Shriram Transport Finance Company Limited, launched a Mobile Medical Unit (MMU) today in Silchar amidst a host of dignitaries hailing such move. A first of its kind in Northeast with Kamrup district to launch such facility in September, this MMU would cater to truck drivers, their helpers and even to other members of their community, twice a month, absolutely free of cost. “Based on the screening and diagnosis done by the doctor, the prescribed medicines shall be dispensed free of cost. 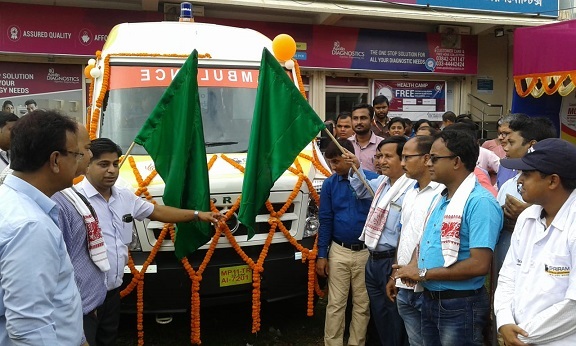 This Mobile Medical Unit will have a pre-defined calendar and route plan for delivering the services covering 11 locations of Cachar district,” Bhattacharjee said. He added, each location would be covered twice a month and they have plans to add more services in the days to come.